Agilent Technologies introduces the portable and fully integrated N4392A optical modulation analyzers with a laptop-size screen, compact design and affordable price. 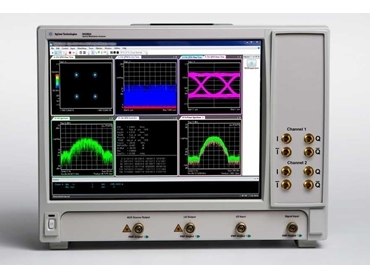 The new Agilent N4392A optical modulation analyzers are now more accessible to engineers who need to analyze complex modulated optical signals during development and manufacturing of 40/100G coherent transmitters and receivers. The N4392A enables engineers to characterise components such as in-phase quadrature modulators and integrated coherent receivers designed according to industry standards for 100G coherent transmission. The integrated design significantly accelerates setup and eliminates configuration effort so users can focus on design challenges. Built-in performance verification and recalibration routines deliver high-confidence test results and extend the recommended recalibration period, improving uptime and lowering the cost of ownership. Featuring the form factor of a mid-size oscilloscope built using advanced integrated circuit technology, the Agilent N4392A optical modulation analyzers offer true portability with their small size. A 15-inch analysis screen shows more information at the same time, making it easier for engineers to characterise complex modulated optical signals.